McGill offensive lineman Laurent-Duvernay-Tardif became the 10th player in CIS history to be chosen in the NFL Draft when he was picked by the Kansas City Chiefs the sixth round (200th overall) of the 2014 National Football League Draft, Saturday. 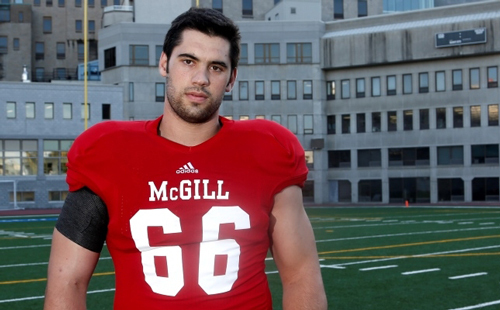 The Kansas City Chiefs selected McGill offensive lineman Laurent Duvernay-Tardif in the sixth round (200th overall) of the 2014 National Football League Draft, Saturday. The 23-year-old medical student becomes the 10th player in CIS history to be chosen in the NFL Draft and the first since 2012 when Regina’s Akiem Hicks was picked 89th overall by New Orleans. Among a single-year record four Canadian-born prospects selected, Duvernay-Tardif is also the first NFL pick out of the Quebec-based RSEQ conference since McGill defensive lineman and long-snapper Randy Chevrier was drafted by Jacksonville in 2001. A co-captain with the Redmen, he was a two-time all-Canadian who won the prestigious J.P. Metras Trophy last fall as the most outstanding lineman in Canada at the CIS level. He was one of two CIS players to play in the 2014 East-West Shrine Game, a showcase primarily for graduating NCAA seniors. If Duvernay-Tardif plays in the NFL, he would become the third McGill player to do so, joining Chevrier (Dallas, Cincinnati) and Jean-Philippe Darche who signed as a free-agent and had a nine-year NFL career with Seattle and Kansas City. Darche – whose younger brother Mathieu Darche went on to an NHL career – is scheduled to graduate from the University of Kansas medical school on May 17. One adjustment Duvernay-Tardif faces in the NFL is having defensive lineman set up across from him instead of a yard off the ball. But he successfully dealt with that in January at the East-West Shrine game in St. Petersberg, Florida. He is also the top-rated pick for the upcoming Canadian Football League draft, slated for May 13. At least 16 NFL teams had either expressed interest or requested info on him during the 2013-14 school year, and he was invited for personal interviews with the Packers, Dolphins, Eagles, Cardinals, Seahawks, Bills and the 49ers. To see a video of Duvernay-Tardif’s reaction after being drafted, go here. To see a video of Kansas City Chiefs’ scout Pat Sperduto evaluating Duvernay-Tardif, go here.